Making My 6th Doctor Costume: No steampunk here - this is the real thing! No steampunk here - this is the real thing! Just before I embark on making the next coat, I thought I'd share with you the sewing machines I work on. 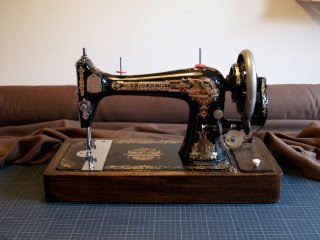 When I was young my Mother had an old hand-crank Singer sewing machine which had been passed down to her from my Father's Grand-Mother. I would watch in awe as she would use it to make various cushion covers, bed spreads etc, wondering how this machine could make such neat, tight stitching. It wasn't too long (aged about 10 or 12) that I got to use it myself so I could make my own Muppets (I had become a fan of the tv series at the time). I soon became proficient at using it and have always used one ever since. I just cannot imagine using an electric machine. I prefer the connection I feel when using a hand-crank machine. You turn the handle a quarter turn, and the needle drops just enough to lock with the thread below. I am always worried the slightest touch of an electric machine and it would run away from me, powering though fabric I was not ready to sew. Sadly following my parents' divorce, the machine went back to my Father's side of the family, and my Mother had to fins a new one, which she eventually did, in the window of a local charity shop. It wasn't a patch on her original one though, being a later, more lightweight, and as a result, less powerful machine. It did the job though - and I would borrow it from time to time. When I was getting into making my own Tennant coats, I found my own machine for £10 at a car boot sale, held as part of the worst village fete I have ever been to. I cannot describe how rubbish it was. It was like the one seen in The Vicar Of Dibley - but less professional. For example, one of the prizes in the tombola was a bag of Walker's Crisps! However, the event did give me my first Singer machine, so I can't complain too much! This was, like my Mother's, a later model, and didn't sew that tight, which could be annoying. I then trawled eBay to see what I could find there, and before long I had tracked down the EXACT same model as my Mother had owned back in the 1970s. I think I paid about £30 for this one - but it was worth EVERY penny! It was so nice to get back behind a machine that had some welly. Where my first machine would falter at thick material, this just breezed through. Every Singer machine has a serial number on a little plate attached to it. Mine is S229566. Looking on that site, I found it was model 27K and had been made in the early part of 1906 in their Kilbowie factory on Clydebank, Scotland as part of a run of 60,000 machines. So it is over a HUNDRED years old!!! And as a testiment to how well they were built, it worked absolutely first time (after applying a little oil as TLC). You can't say that about many things out there - still working well at 103 years old. I made and completed the Mk III on this prize machine. The only problem with these machines is that they can only stitch in a straight line, so fancy stitching is out of the question and sewing a buttonhole is a pipe-dream. 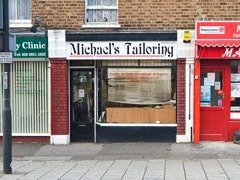 To solve the buttonhole problem, I have used an old fashioned tailor called Mr Michael I used to use in my home town of Edgware, North London. It's only a few miles from where I now live, and he does not charge much for doing them for me, though they are never sewn that firm, and it is a bit pot luck as to what colour thread he uses. It was a bit funny the first time I took on of my Tennant coats in to get the buttonholes done. I don't like to blow my trumpet too much, so I just took it in and without any fuss just asked him to put the buttonholes in for me. He looked at me a bit oddly. Then he said 'You bought a coat, and it doesn't come with BUTTONHOLES?' Then I realized, yeah, that would be a bit odd! So I had to confess that I had made it. He was impressed - which made me blush. When I got to the Mk III coat, I added the buttoning detail to the back slit below the waistline. I realized that I needed to get these buttonholes down while the coat was still being made, rather than waiting until it was complete. This would be a pain, as Mr Michael asks for at least a week to get it done, which would hold me up. I then wondered if I could find a cheap electric machine on which could just do buttonholes. The cheapest I found was still not cheap enough, so I looked on eBay to see if I could find a second-hand one a little cheaper. 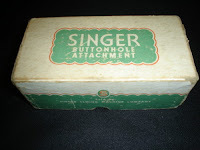 (I hoped my Singer machine would forgive me for looking for a new fanggled electric machine). 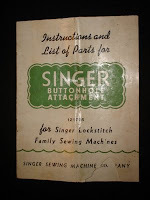 My jaw dropped when I did my search: there were a couple of buttonhole ATTACHMENTS for the old Singer machines. I found a UK seller, and bid on one, which I won for around £15 inc postage. When it arrived, it came in a small branded box, and still had its original instruction manual. It seem to be complete and after following the directions, I had it attached to my machine and gave it a go. After adjusting the torque control until it was strong enough to drive the attachment, I sewed my first buttonhole. To be honest, it was crap, but I could see the potential was there! Re-reading the manual gave me clues as to how to get a better result, and before long I was knocking out some pretty decent, presentable buttonholes. 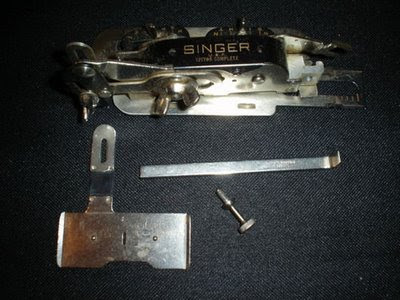 It was amazing to think that all these years I had thought that there could never possibly be a way to sew a buttonhole on a Singer hand-crank, but the technology had been there the whole time, but I didn't know it existed!!! I was later showing it to a friend who has a modern electric machine, and she told me that she can do a buttonhole, but it was one size and shape, with no option to change it. The attachment I had - which is at least 60 years old, maybe older, has various sliders and pivots which allow you to alter the length and width of the hole; how wide the lines are set apart; how wide the stitching is - all the things to make a perfect buttonhole!! Oh wow, that is really, really cool! 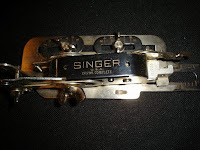 I have a Singer featherweight (made in 1948, thank-you for the link!) that can be operated by hand or electricity. I am wondering now what it would feel like to sew on a model like yours.